In recent years, Moscow’s three airports have all undergone massive renovations. Today, passengers traveling through Domodedovo, Sheremetyevo and Vnukovo benefit from modern infrastructure that is also in line with trends in energy efficient design. Arriving at Sheremetyevo, on Moscow’s northern edge, which opened in August 1959, used to be a grim experience. The plain walls and harsh lighting offered little comfort to passengers and the few food options were snack bars. That changed with the opening of Terminal D in 2009. French architect Dominique Chavanne, who designs high-tech buildings in Europe, helped create Terminal D. The image that guided the design of this terminal was a giant swan with outstretched wings, inspired by Tchaikovsky’s Swan Lake. The terminal’s center is a glass dome located above passport control. The 1.8 million square-foot building has capacity for 12 million passengers and offers numerous food options and duty free shops. For local drivers, a multilevel parking garage is joined to the main terminal building by a covered pedestrian walkway. The terminal primarily serves Aeroflot and its SkyTeam partners. The construction of the terminal was one of the conditions of Aeroflot’s SkyTeam membership. Terminal D is full of high-tech additions to make travel more pleasant and convenient, such as a SleepBox capsule lounge that provides transiting passengers a place to take a nap while waiting for their next flights. Additionally, the adjoining Terminal E boasts an express aerophobia treatment center offering psychological assistance. Each 30-minute session involves counseling with specialists in aviation psychology. Vnukovo Airport’s Terminal A – the largest in Russia, spanning 2.7 million square feet – opened in 2010. 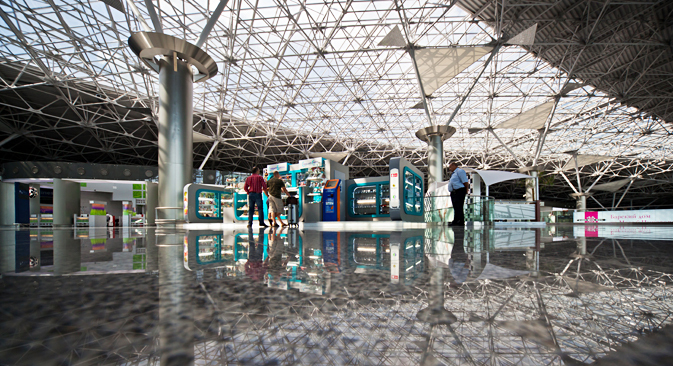 The new terminal boosted Vnukovo’s throughput capacity to 20 million passengers a year. The terminal’s designers, German design bureau Obermayer Consult, planned the terminal to resemble a teardrop. The completed complex has 52 departure gates. In the center of the drop, around the tower that holds the air traffic services, is a tropical garden. A waterfall flows down the walls of the tower itself into a pool at its base. An opening in the shape of the eye made up of approximately 35,000 square feet of glass triangles allows natural sunlight to filter through the terminal during the daylight hours. The glass triangles are supported by a special system capable of withstanding up to 550 pounds of snow. Durable technological glass that lets ultraviolet rays pass through has been installed on the tower, allowing tropical trees and plants inside the terminal to receive natural sunlight. Vnukovo meets European energy efficiency standards thanks to its use of smart climate and lighting systems that automatically regulate temperature, humidity, and brightness within the airport’s premises. Domodedovo, located in Moscow’s southeast suburbs, opened in 1964 but underwent renovations in the early 2000s that made it one of Russia’s most modern air hubs. The airport was completely lined with glass and its mirrored surface reflects the sunlight, boosting energy efficiency. However, as airlines shifted operations to Domodedovo from Sheremetyevo, the airport became Russia’s busiest and passengers complained of overcrowding. Today the second segment of a new passenger terminal is being built at Domodedovo. When completed, it will be twice the size of Terminal 5 at London Heathrow – the equivalent of 61 football fields. It was designed by British company RMJM and uses the under-the-roof concept, which means that passengers from all flights will be serviced within a single terminal. One of Europe’s largest air hubs – Amsterdam’s Schiphol Airport – operates under this concept. All three airports are served by Aeroexpress rail links with train stations in the center of Moscow, which allows travelers to bypass the city’s notorious traffic jams.